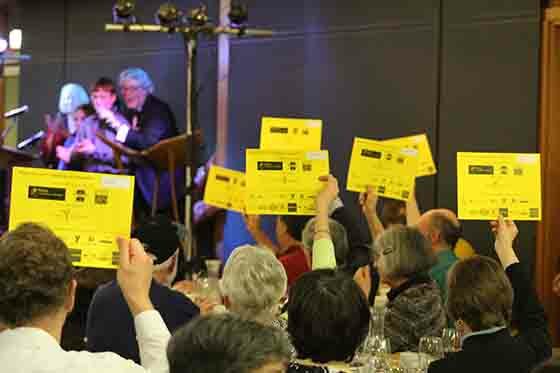 The Port Townsend Marine Science Center (PTMSC) raised more than $126,000 during their annual Tides of March benefit auction and dinner last Saturday — a new record for PTMSC. “We greatly appreciate the support of our members, donors, and volunteers,” said Marine Science Center Executive Director Janine Boire. “These funds will help us work side-by-side with more volunteers and partners to continue to grow our efforts toward conservation of the Salish Sea through our exhibits, education programs, and citizen science.” The Tides of March auction is the Center’s biggest fundraiser of the year, bringing in a sixth of PTMSC’s annual budget in a single evening. Proceeds allow the Center to connect face-to-face with over 20,000 people each year, spreading the message of marine health and local action. This year’s auction reached a new fundraising high, surpassing last year’s total by 14%. The Marine Science Center is open Friday through Sunday, 12-5 pm. Their hands-on marine exhibit re-opens for the spring season April 1. Check out Volunteer Coordinator Amy Johnson's blog post for auction photos and highlights!